Maternity and newborn photography is an exciting new photographic specialty with a growing market. In this book by professional photographer and Canon Explorer of Light Sandy Puc, you will find both information and inspiration. 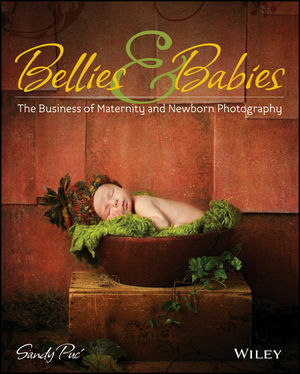 This book covers technical aspects such as equipment, lighting techniques, and composition, but also examines the human side of the equation: how to make moms comfortable during the shoot, tips on photographing newborns, suggestions for props and poses for children under a year of age, and much more. Additionally, it will include business strategies for photographers who are looking to expand into this bourgeoning market. Bellies and Babies: The Art of Maternity and Newborn Photography offers photographers both the information and ideas they need to successfully photograph expectant mothers and newborns. Sandy Puc' holds the prestigious titles of Print Master and Explorer of Light from Canon USA. Her highly successful studio is known for the outstanding quality of both the work and customer service. Sandy conducts numerous workshops each year.